The Northern League and Five Star Movement (M5S), who have been struggling to form a government since the country's March elections, are on the cusp of reaching a deal that would open the door to a joint government, and that appears to finally be shocking Italian markets which are not happy this morning. Matteo Salvini, the head of the League, said negotiations were in the "final straight," and that an agreement would likely be reached Wednesday. A M5S representative offered similar assurances. A "government contract" will likely be released tomorrow, they said. And while representatives for both parties have since denied that it was ever part of their platform, reports that the new government had been planning to ask the European Central Bank to cancel 250 billion euros in Italian debt have rattled the country's sovereign bond market, pushing yields on the 10-year BTPs over 12 basis points higher, the biggest one-day move since July 2017. 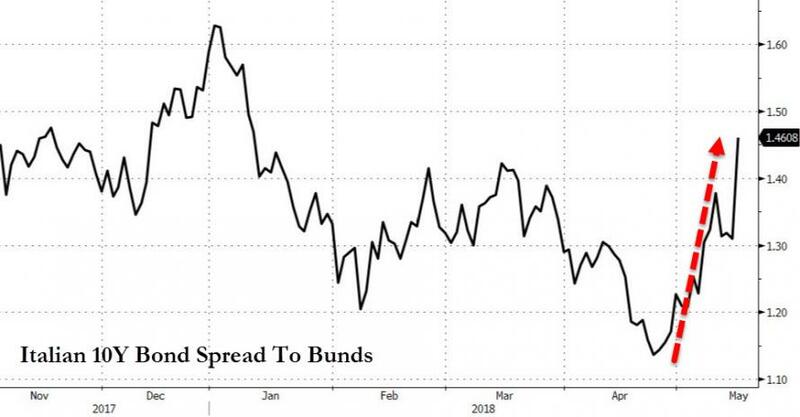 The long-overdue BTP selling, previewed by Goldman one week ago in "Italy's political risk increases, and yet the markets remain complacent", has sent the Italy-Germany 10Y spread to 147 bps, the widest since the March 4 elections. 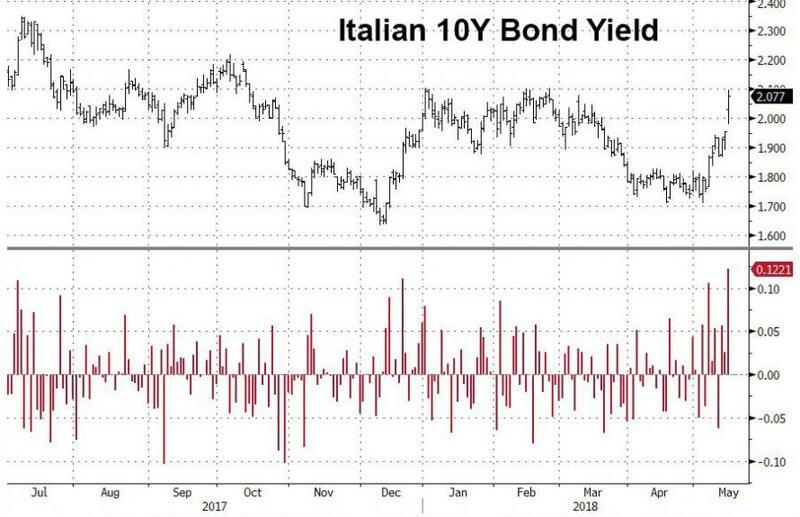 Jason Simpson, a strategist at SocGen, told Bloomberg that "this is all fairly disruptive stuff for Italian bonds...the markets had been assuming that they would tone down some of their more radical views." Several other difficult issues also need to be ironed out. League leader Matteo Salvini and M5S leader Luigi Di Maio must still decide who will become the country's next prime minister. Local media reported that they had discussed several options, including alternating at the helm, or having different party members take turns. Debt cancellation wouldn't be the only swipe taken at the European establishment. Claudio Borghi, the League's economic spokesman, said his party would like to "abolish the fiscal compact" that restricts EU members from blowing out their budget deficits. "We want to abolish the fiscal compact...We want to overcome the misunderstanding that there is no money given that France went on for the last 10 years in exceeding the deficit-to-GDP limit and both France and Spain already have a public debt higher than 60 percent of GDP." Italian President Sergio Mattarella, the official caretaker of the government, has agreed to an extension for the talks as the two sides try to iron out policy differences like whether to roll back changes recently made to pensions. But he too has expressed concerns about the party's pledges on fiscal and foreign policy. The parties’ draft policies so far echo their key campaign proposals - a flat tax for the League, and Five Star’s citizen’s income for the poor. Analysts have voiced concern about certain spending proposals that have been bandied about - including a plan to slash the main tax rate for companies and individuals to as low as 15% - could run into obstacles in Parliament since they would further destabilize the country's public finances. The latest media reports citing sources within M5S said a government contract between the League and M5S would be released "as soon as tomorrow" - though this wouldn't be the first time that an agreement has been just around the corner, only for talks to fall apart once again.